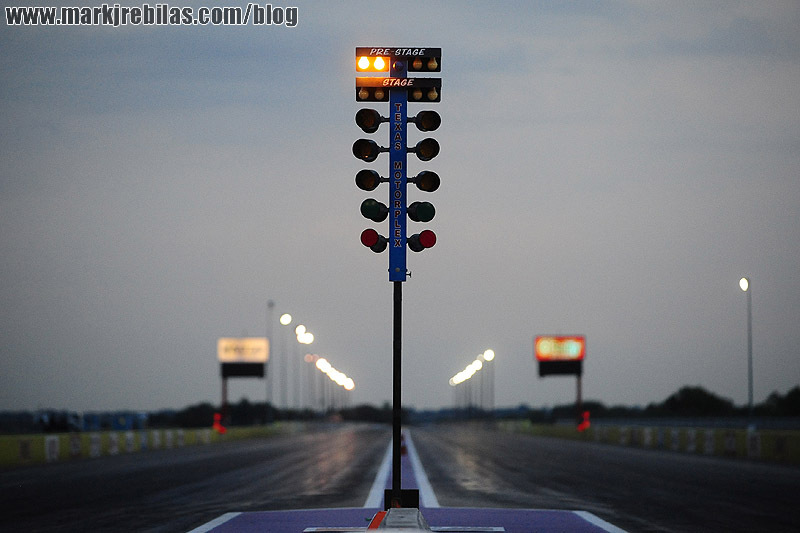 (Lead photo credit: Mark Rebilas) – Today we think nothing of seeing two drag racing cars leave the starting line after a brilliant flash of yellow or a sequence of yellow lights followed by a green instruct them to do so. The iconic “Christmas Tree” is as deeply engrained in the sport now as slicks, burnouts, and nitromethane. Such was not the case back in 1964. 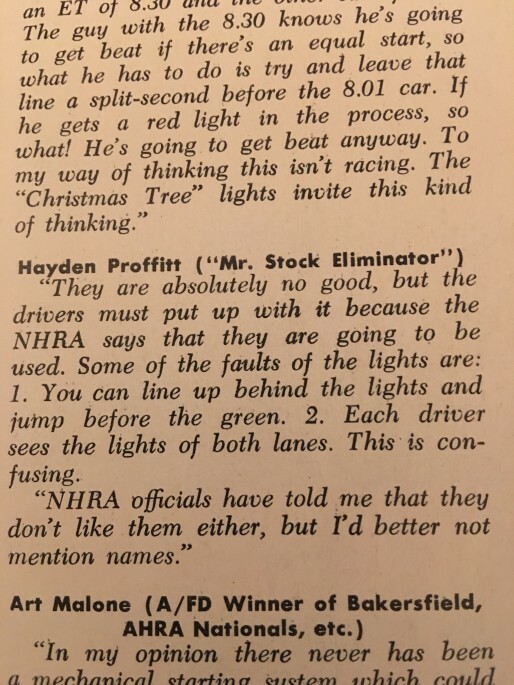 The Christmas Tree made its debut at the 1963 US Nationals and it threw a massive curveball to everyone in the sense that no one had ever seen it before, no one knew how to deal with it, and everyone was very comfortable with reacting to a flagman which had been the SOP for drag racing since its inception to that point. The Nationals represented a turning point and not surprisingly, everyone seemed to hate it. 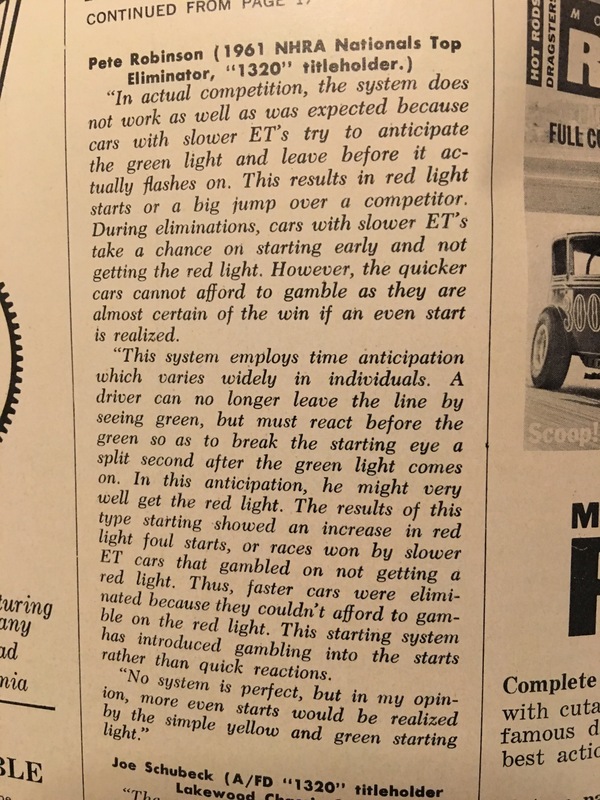 Drag racers enjoy change like Kim Jong Il enjoys failed missile tests. NHRA Division One director Lou Bond was one of the central figures behind the development of the tree and reportedly he did not take too kindly to the drag racing media’s approach of publishing about half a million quotes from the most notable drivers in the sport trashing the thing and the entire idea behind it. One can understand the position of the established drivers. The guys who were the gods of the sport did not want to give up an edge that they clearly had over the other racers that they faced down. 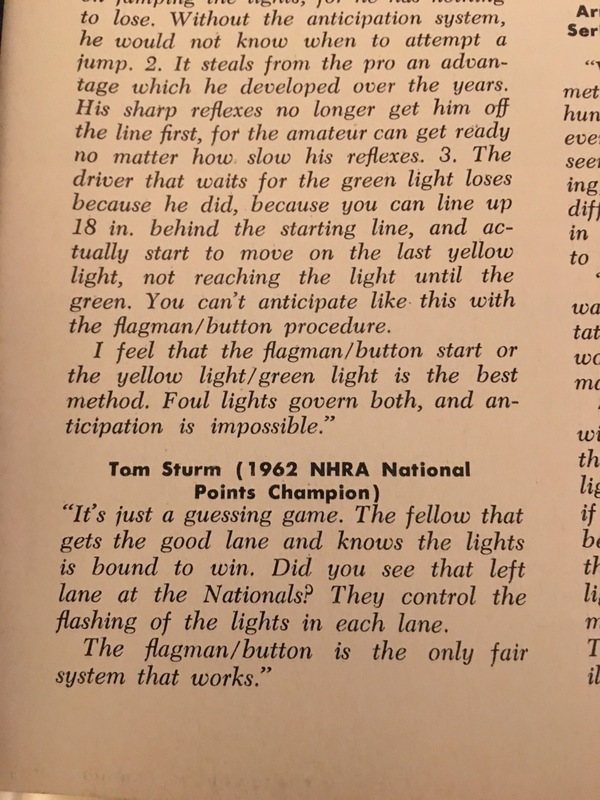 These guys knew the flagman routine and frankly they knew lots of the flagmen. Whether it was NHRA or match racing, “reaction” times were how quickly you could get the clutch out when the flagman started moving and there was no warning (wink wink) when that would happen. 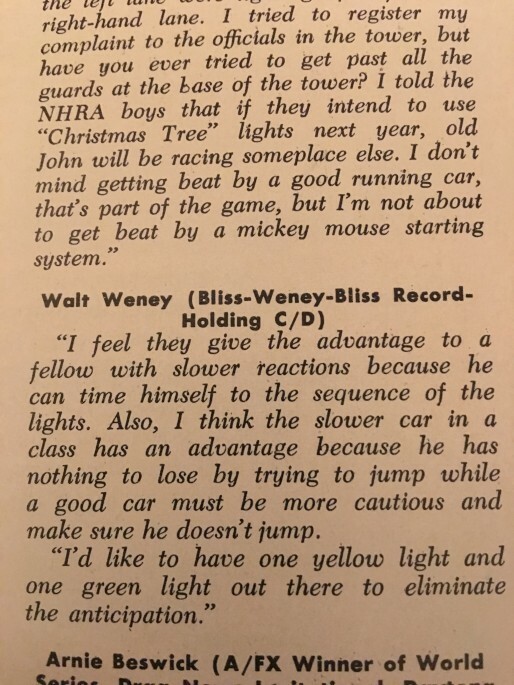 With the advent of the Christmas Tree it was now possible to figure out when the green light was coming on and the fact that slower cars could “react” quicker and get a jump on the faster guys was a game changer. 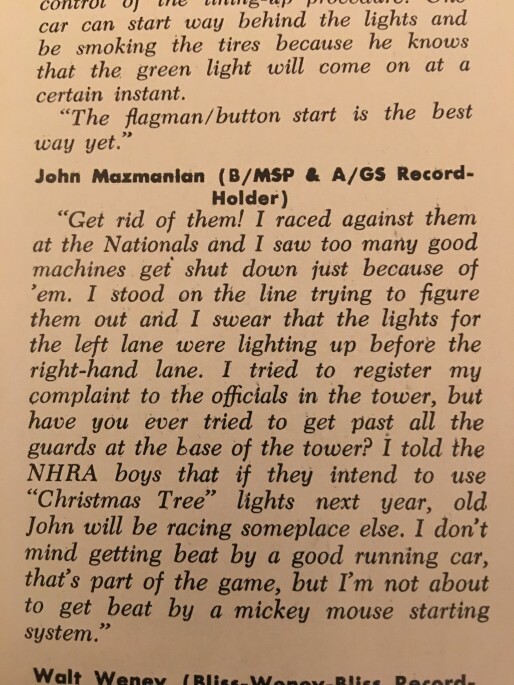 Being good on the starting line was now a practicable skill rather than a study in analyzing the human behavior of a flagman. The whole program changed from a reflexive action based upon the movement of a starter to a fairly predictable but still tricky system. 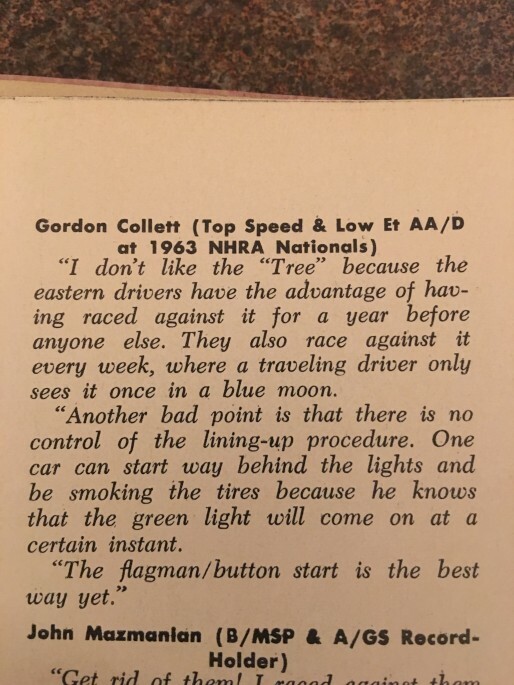 Racers like Ohio George Montgomery were among the first to learn that “waiting for the green” was absolutely the wrong thing to do. 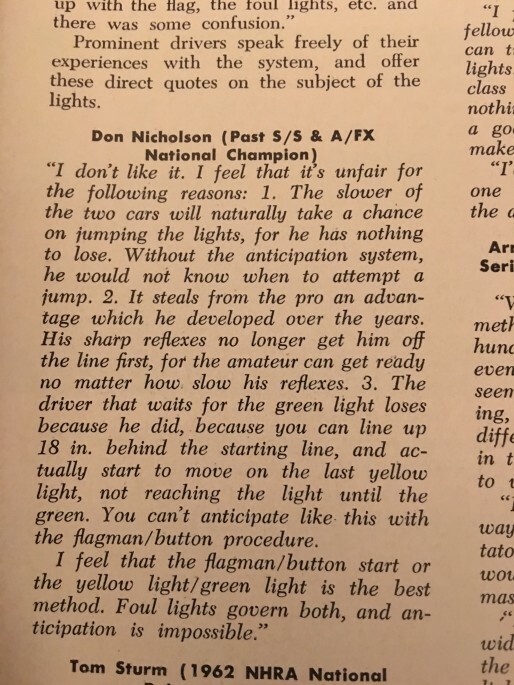 There were no reaction timers back then and the staging procedure was lots different from today but this was something that sent some real shockwaves through the sport. Adding to the frustrating nature of this discussion is that the NHRA basically had the only Christmas Trees in existence. 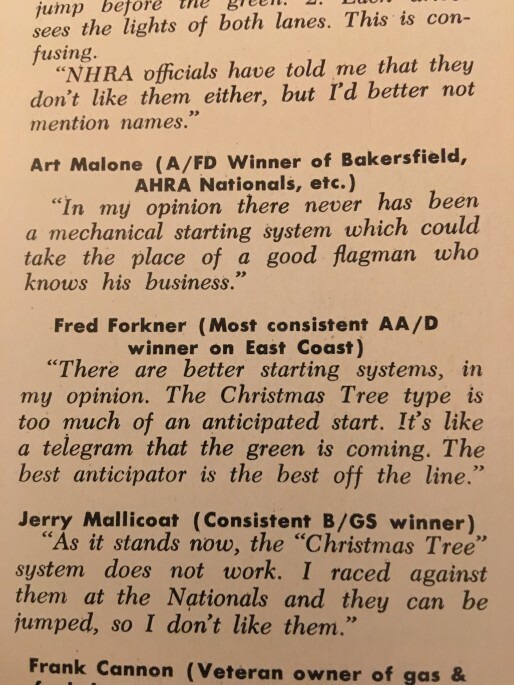 For the few NHRA national events that there were each year (2 in 1964 and expanding to 4 in 1965) as soon as the racers pulled out of the gate to head on their match racing tours they never saw another tree again until the next NHRA event. 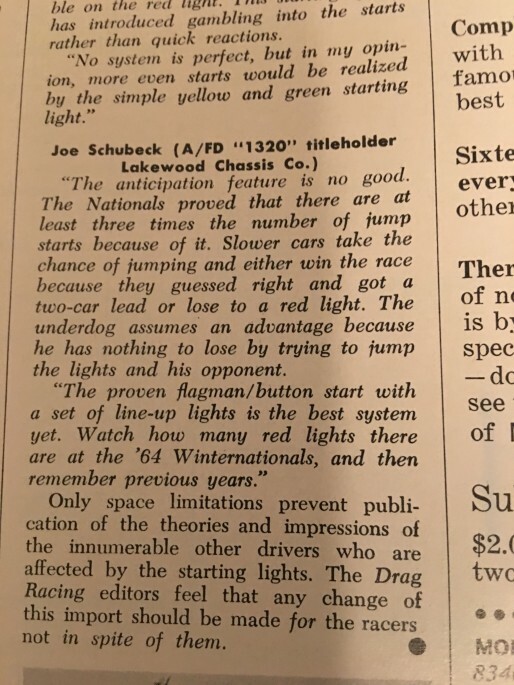 Again, you can see why the racers were confused and frustrated. 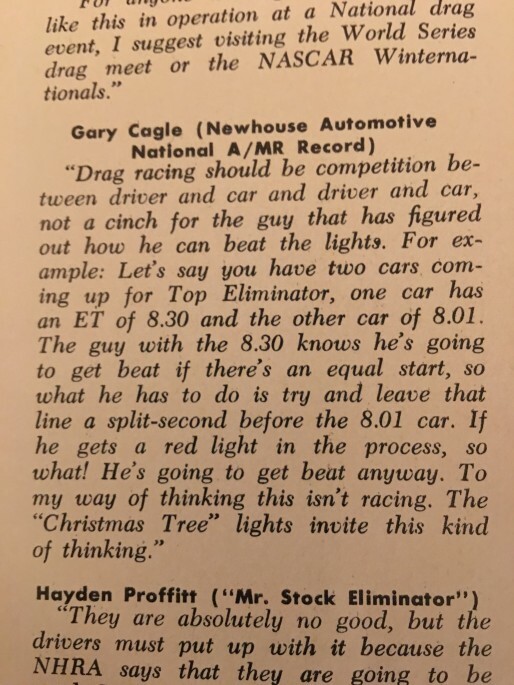 Like all big ideas in history, the initial objection and resistance to the thing was not ever going to slow its proliferation into the sport and it did not take long at all before the Christmas Tree was the standard for any strip worth its salt across the country. 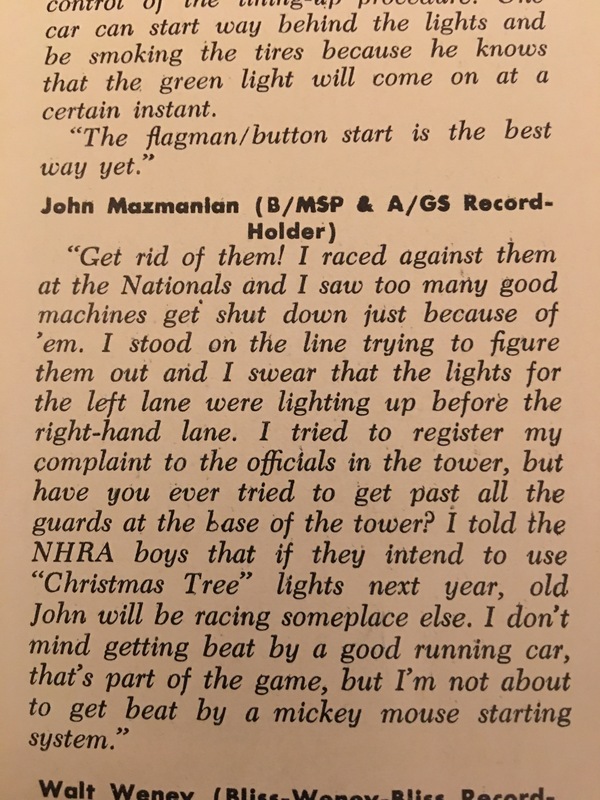 The racers did not have to like it, but they did have to deal with it if they wanted to compete. Oh…one more fun fact. 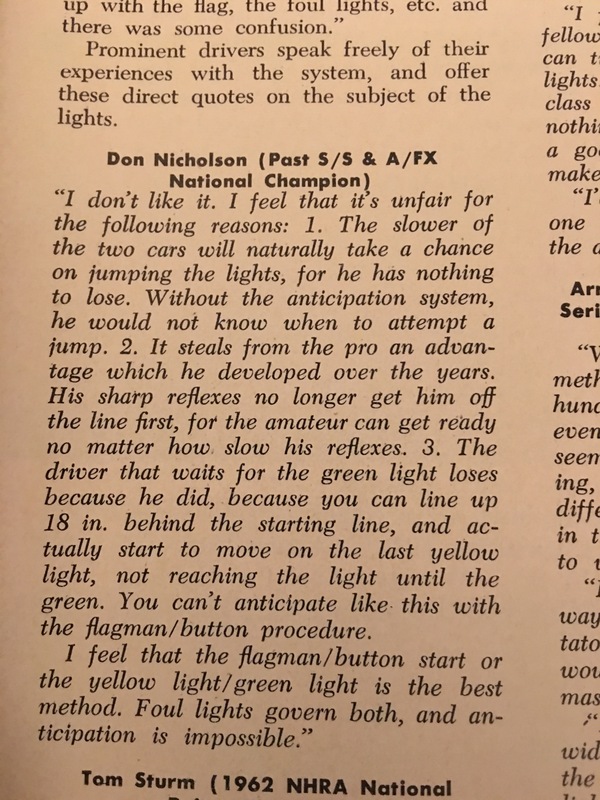 It was not common practice to disqualify someone for their first foul start back then. If you jumped the tree you got a couple of shots to get it right!